One: Six Flags Over Texas is open daily until Aug 22, then open weekends throughout September. Six Flags falls into seasonal hours after Labor Day Weekend (Sat-Mon) and Saturdays and Sundays September 10-25. Ride wait times tend to drop this time of year, as do the temperatures—so it can be an especially enjoyable opportunity to experience one of the premier theme parks in the southwest United States. Two: Six Flags Season Pass holders get extra perks on Labor Day Weekend. Present your season pass at the front booth to get free admission for a friend — it’s that simple! Three: Six Flags is making a big announcement on Sept. 1, and you’ll want to be involved. We don’t know much more about it, except that there will be giveaways, contests, and an announcement regarding 2017 rides. Sign up to learn more. Four: Cooler temps let you take advantage of Six Flags’ picnic grounds. Did you know that there are BYO picnic grounds right outside of Six Flags’ gates – and that there are catering options available if you want to host a large special event or group outing? Five: The back-to-school season is a great time to play a Six Flags-themed weekend getaway. Take advantage of the end of the tourist season to book a discounted vacation package, complete with lodging, for a Six Flags weekend getaway. Pairing your Six Flags visit with a Rangers outing is sure to turn your getaway into a grand slam! If you end up staying in town, you can get a free ride to the front of the Six Flags gates when you stay at an Arlington hotel thru the Arlington Trolley. Good News: Love Halloween? Six Flags is the place to be in October. Say “boo”, boys and ghouls! 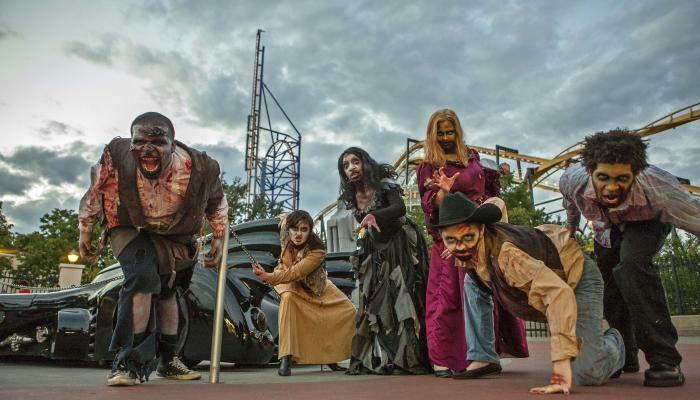 Six Flags Fright Fest is open Sept. 30 through October 31. Experience family-friendly thrills by day and chilling frights by night, including “scarezones,” haunted houses, and more —plus yummy fall Six Flags concessions and plenty of gorgeous autumn weather. Bonus Fact (ICYMI): Gotham City is bigger and better than ever. Three new villains took control of Gotham City this summer and are still on the loose…and you’ll love every minute of it! If you haven’t already investigated the new rides at Six Flags, what are you waiting for? The HARLEY QUINN Spinsanity, THE RIDDLER Revenge and CATWOMAN Whip join forces with The New Revolution Virtual Reality Roller Coaster to give you maximum thrills! One of the nation’s premier amusement parks, Six Flags Over Texas is located in Arlington midway between Dallas and Fort Worth (each 16 miles away). DFW Airport is 10 miles to the north. Six Flags is also located in the heart of Arlington’s Entertainment District, which is home to the Texas Rangers and the Dallas Cowboys.